Our award-winning modular casework system is designed for maximum infection control, durability and design flexibility. 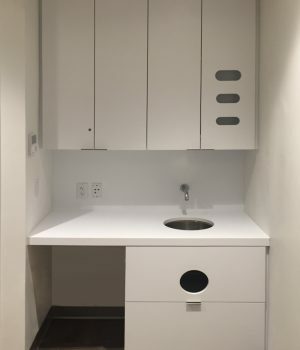 It features all Corian® interior and exterior surfaces and provides a superior and more cost-effective alternative to stainless steel casework. 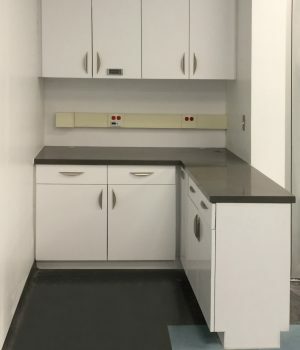 The Futrus® Hybrid Casework System is more hygienic and durable than traditional casework and provides greater long-term value. Corian® touchpoints combine with thermofoil components to create a unique and fully bleach cleanable solution. These doors are designed to last a lifetime. Made entirely of seamless Corian® for maximum hygiene and durability. 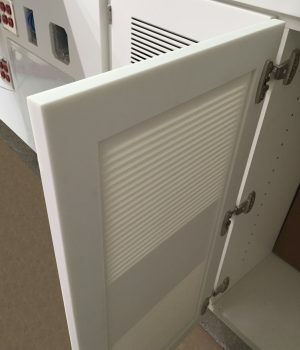 They connect to Futrus® Casework Systems or traditional millwork, using a patented system for maximum strength attachment.